A day would just vanish in the blink of an eye in the entertainment hub, Las Vegas. However, a 24 hours tour of the city in a perfect escape to unwind and party hard in the casinos, experience the sensational nightlife in the Strip, relish on delicious food in the fine restaurants and have a merry time in the numerous adventure spots. Check out a perfect travel itinerary for you to spend a beautiful day in Las Vegas. 8 am: Time for some early morning bite. Take a cab to Freed’s Bakery at 9815 S. Eastern Ave. Cakes and pastries are baked to perfection in early morning at Freed's Bakery. If you still have some space in stomach, then opt for Bayside Buffet at Mandalay Bay where breakfast begins from 7am. 10 am: Both located on the strip, you just need to take a taxi to visit Gallery of Fine Art, Bellagio and Liberace Museum for your appreciation of fine arts in these museums. They are open from 10 am. 12 noon: Take a taxi to Town Square, a super-regional lifestyle center, and have a fantastic experience of Vegas shopping. Get some good swim suites from there to enjoy sunbathing in Tao Beach. 2 pm: Too hungry after day's roaming? Go for Las Vegas buffet. This is one of the best things to do in the city. Le Village Buffet at the Paris Resort and Casino is all to satiate your hunger for Fondue, boeuf bourgignon, crepes, cheeses, and pastries. Also visit the Wynn for other sizzling buffet option. Top of the World Restaurant, Stratosphere could also be a good option for lunch. 4 pm: Take a taxi to Casino at the Wynn to win or lose in luxury. Be adventurous and head to Adventure canyon, Adventuredome at S Las Vegas Blvd, Big apple coaster at New York Newyork, Big shot, Canyon buster. 6 pm: Take a ten minute drive from the Strip to Lotus of Siam restaurant, that has been nominated as the best Thai restaurant in the country by Gourmet Magazine. Try out authentic Thai delicacies like never before from searingly hot beef jerky, to addictive stews, to deeply sour fish dishes. 8 pm: Take a taxi to Bellagio fountain, for that wonderful sight of Vegas' most famous attractions. Visit Aria Resort & Casino for a show of Zarkana. 9 pm: Time for some scrumptious dinner. Hob on a taxi to reach any of the fine restaurants like Aquaknox, Canonita, Casanova, Grand Lux Cafe, Aria or Ceasars Palace. 12 midnight: The right time to shake a leg in Vegas. You can straightaway head to the Chandelier, Minus 5 or Frankies Tiki Room for amazing night time. 1 am: Cars and taxis are available to take you to any hotel or resort, such as Wynn, Mandarin Oriental, Bellagio, MGM Grand or the Venetian located in the Strip. 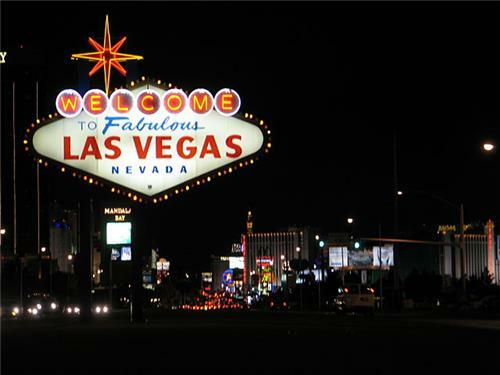 The night is still young, so try on some poker games or blackjacks and feast in the city's casinos. 2 am: Take a taxi to Tacos El Gordo in North Las Vegas, the best late-night bite on the Strip. At this time of night, a bite of tacos adobada would be blissful. Discover Las Vegas with the complete map guide for your one day tour.